Since I’ve needed mindless socks to work on to get through some dense reading lately, I worked up a second pair of garter rib socks. I changed needles for the calf shaping for the last pair but I didn’t have smaller needles on me when I reached the shaping on these so I used decreases. I’m a bit ambivalent about which method is better. I think I prefer changing needle sizes but it’s hard to talk myself into using anything smaller when I’m desperate to get to the heel. The yarn was a little disappointing, given the promise of no pooling. It did not pool with 56 sts on size 1 needles but there was plenty of pooling at the ribbing (64 sts), the heel turn and the toe. While it looks like Koigu or CTH, as Christy warned me at the time I bought it, Shibui Sock is a bit thinner than it looks (along the lines of Lorna’s Shepherd Sock). Nevertheless, that’s one more pair of socks for the rotation and two more skeins of sock yarn gone! I cast on a pair of Latvian Socks from Folk Socks by Nancy Bush with some J. Knits, thinking that this lace pattern would be easy to do while reading. 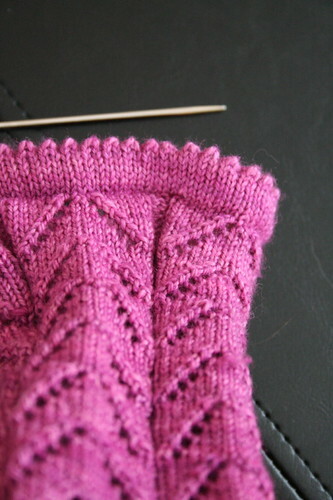 As it turns out, it’s not exactly mindless knitting so I might cast on some stockinette socks. I do love how the pattern works up, however. Isn’t the picot lovely? More on these next week! Finally, I must thank Tiennie, Laura and Stella for tagging me for the Make My Day meme! I’m so flattered! I feel conflicted about choosing only a few people to tag because there are so many of you! Needless to say, my blog roll makes my day. I love seeing the beautiful garments you all create and I look forward to reading your posts about them so you’re all tagged! Have a wonderful weekend! 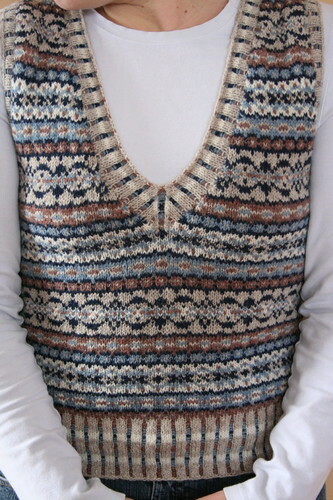 Thank you for your wonderful comments on my vest! I also appreciate the wise knitters who pointed out that Beaverslide should not sit in a closet and that I should rip the raglan. I know you’re right. After all, if our positions were reversed, that’s exactly what I’d be telling you to do. In fact, I think I told Liz K just last week that she should rip rather than settle for a too-long sweater with a perfect tubular cast on. If spring were not just around the corner, I would be ripping away. Instead, I will let my sweater alone until next fall when I could really use 900 yards of Beaverslide. In the meantime, I can show off another pair of dull socks. 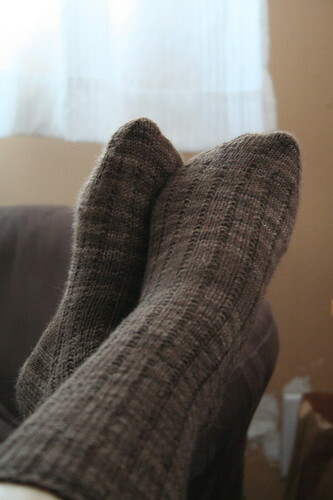 These might be my favorite every day socks yet, if hopelessly dull to knit. This was the first time I’ve ever used Koigu (much to my amazement) and I definitely think it is worth every penny, even if the yardage is CRAP. Fortunately, Julieknits at Ravelry had half a skein of this color that she generously sent me because, as I may have mentioned before, Koigu’s yardage is crap. 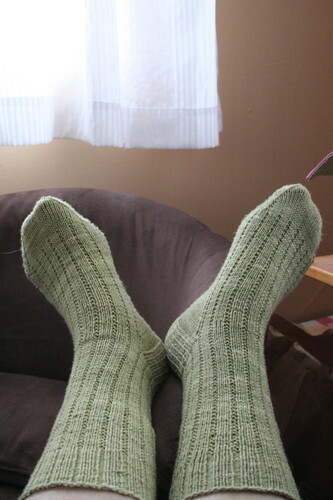 I actually finished these with less than 12 inches of yarn. I used Julie’s yarn to reinforce the heels. I’m stunned that I almost ran out. I have tiny feet and these legs do not strike me as particularly long. What’s a girl with even average sized feet to do? That would be an expensive pair of 3-skeined socks! I experimented with some calf shaping by dropping down to a size 0 needle for the lower part of the leg. 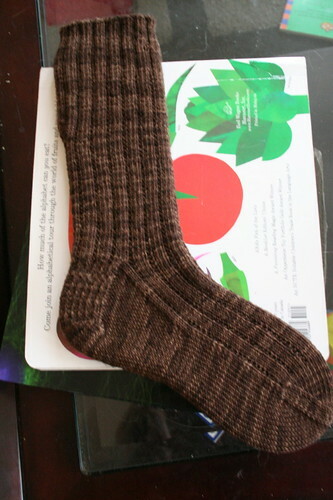 The rest of the sock was knit on size 1.5 needles. You can tell that I’ve been doing a lot of studying lately because I’m just cranking out easy socks. 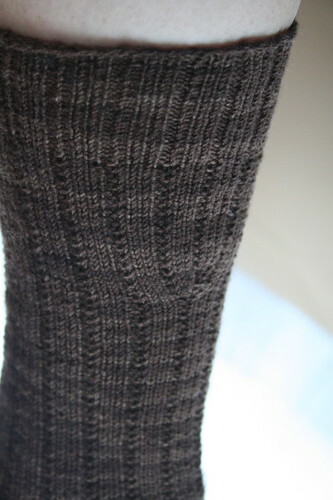 Here is the first of another pair of 3×1 garter rib socks in Shibui Knits Sock, although this time I used decreases for the calf shaping. Glenna has also been testing out methods to get the perfect, slouch-free sock. You should check out the cool knee socks she just finished. I used to think that I couldn’t last through knitting knee socks but I suspect with the right yarn, it would be possible. 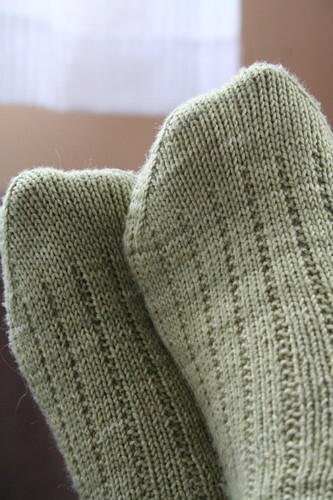 After I knit the first pair, I really wanted to go buy more Koigu. 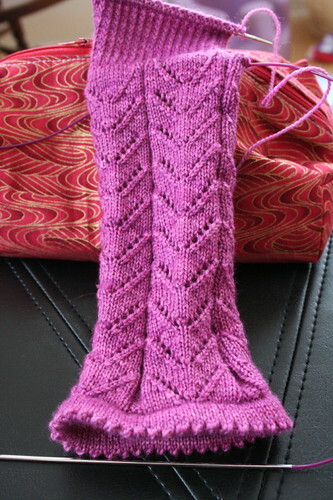 It makes such a nice sock in spite of the yardage. Nevertheless, I simply cannot bring myself to buy more because of the sock yarn I have in stash. I tried adding it up in my head and I came up with enough yarn for 9 pairs. That seemed like a lot until I tracked it all down. Try 21 pairs. And some of it is really, really nice too! I decided that it would be an appropriate exercise in self-discipline to knit what I have, if only to punish myself for buying icky yarn (hi, Knit Picks Essential) just because it was cheap. So here you have my 21 potential pairs, although I cheated a bit and included the Froehlich I just used up because it was so old and I was so proud of myself for getting rid of it. I hope chip away at this until at least all of the Knit Picks is gone so that I can buy nice yarn guilt-free. In the meantime, I will be living vicariously through Megan and her twelve lovely single socks. FO Parade: Three Sweaters in One Post! Thank you all for your sweet comments on my striped socks! I had no idea striped socks would cause such a stir. I must say that the opposite striping was less of a design element and more of my inner cheapskate trying squeeze out as much sock as possible from two skeins. I’ll put together a tutorial on better striping in the coming weeks. For now, I have not one but THREE finished objects for you! 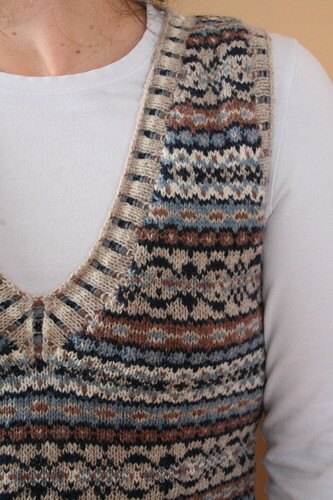 The Ivy League Vest is the only real FO, the others are December knits I haven’t yet blogged. Modifications: I used blues instead of a teal/loden combination, omitted Pearl (gray) and sized up (37.5″) because my gauge was almost 8 sts/in instead of 7 sts/in. I also knit the ribbing on US 4s. When I cast on on 2s, it was too small so I did all of the ribbing on 4s. In this picture, the back view looks stretched out at the bottom but it’s not. I just didn’t notice the weird distortion until after I put the camera away. My only regret is that I didn’t make this longer. It fits fine and I’ll wear it but I would love a few more inches. I thought about extending it early on but decided that 14″ from underarm to bottom would be enough. I’ll know better next time. 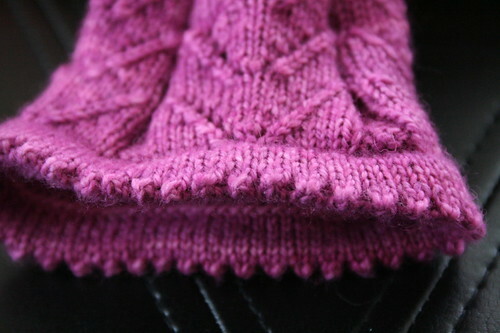 This next FO is a sweater that I started in September when I met Christy in Portland. I finished it in October but it required some fixing so I let it stew until December when I finished it up for good. 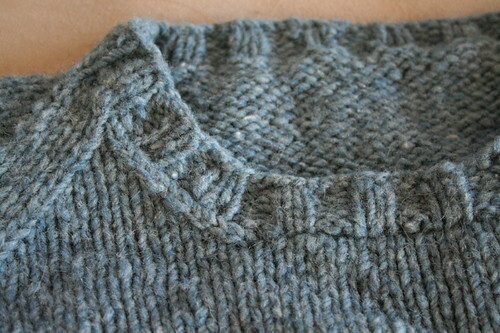 Modifications: I knit the medium size but since my gauge was off 1 st/4″, I should have gone down. The shoulders are too wide and while I can live with dropped shoulders, this made the arms WAY too long. I cut off both sleeves near the underarm and reknit them down to the cuff. I decided to reknit the sleeves completely to get the shaping to fit in the appropriate places. I think the sweater is OK, although I probably wouldn’t knit this again unless I were using a very rigid yarn. Knit Picks WoTA is a little too drapey for my taste. The other problem is that I haven’t yet found a clasp to keep this closed so I haven’t worn it. I would like to wear it open but the fronts just flap around and look peculiar so this will be a closed bolero for me! Finally, the raglan from Hell. 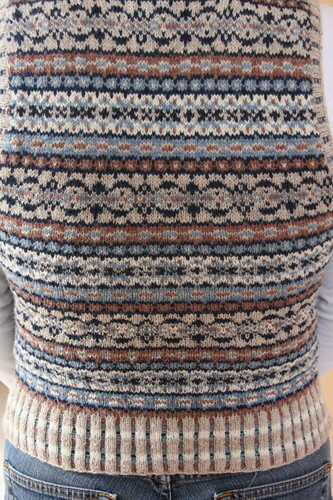 I’m calling it the Top Down-Bottom Up-Top Down Raglan. I knit this in December and never got around to blogging it because frankly, I hated this project. Nothing about it worked. 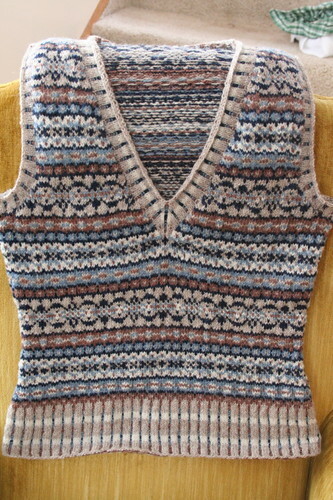 I used Barbara Walker’s Classic Raglan Pullover pattern, knit a swatch, washed the swatch, measured, calculated stitch counts and knit from top to bottom. It should have been the perfect sweater because I did everything you’re supposed to do! Well, it wasn’t. Not even the FO pictures I took came out properly so this is all you get. This sweater is one for the closet. The only redeeming aspect of this sweater was the yarn. Beaverslide is a dream to work with and it stands up to frogging like you wouldn’t believe! I will definitely be buying more. It’s just the perfect tweedy wool. It would be much better for cables too! I intend to wear this sweater in spite of my complaints about it. However, I will not rule out frogging it at a later date to reuse the yarn!